The Convergent Media Collective hosts a wide array of talks, but one topic we hold dear to our hearts is open culture, whether it is open source software, hardware, education or thought in general. 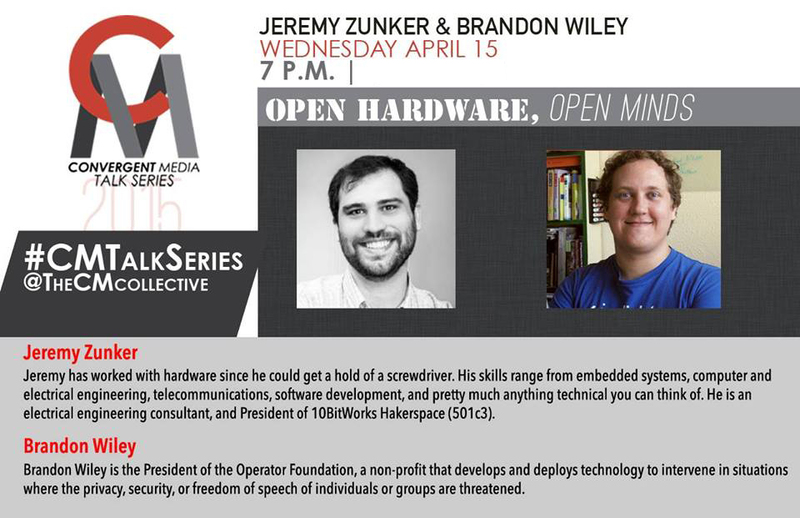 We are proud to have Jeremy Zunker and Brandon Wiley, two individuals who have furthered the field of maker and hackerspaces, as well as open source software and hardware implementation speaking to our audience. Both represent and bring a whole hearted persona to their respective spaces and fields that is truly welcoming. So join us to hear about their latest initiatives and projects. Prepare to be wowed! Description: In the 21st century we are faced with creative communities that go beyond traditional art and into the digital realm, both at a hardware and software level. As a young child Jeremy tinkered, both with technology and social norms. His interest in being an explorer of the digital realms has taken him on a journey that his landed him in search of liked minded, thinkers, doers and creators. In his talk Jeremy will talk about his journey of helping make 10bitworks, a local hackerspace, into what it is today, a full functioning space that incorporates multi faceted activities that serves San Antonio’s creative community in ways that few other organizations have been able to. Bio: Jeremy has worked with hardware since he could get a hold of a screwdriver. His skills range from embedded systems, computer and electrical engineering, telecommunications, software development, and pretty much anything technical you can think of. He dabbles in art, and has participated in Luminaria as an artist and has done a few collaborative pieces with local artists. Additionally he dabbles in neurology, amateur radio, science and anything else that strikes his fancy. He is an electrical engineering consultant, and President of 10BitWorks Hakerspace (501c3). Description: Historically, hardware consumer electronics devices have been associated with large-scale industrial manufacturing, offshore factories, and multinational corporations. The modern mobile telephone is the pinnacle of consumer electronics culture. The information age is the era of the always-connected portable computer in your pocket, the most intimate of communication, memory, and entertainment devices. We accept as a matter of course that with the miracle invention of mobile phones we accept certain properties of mass-produced goods such as planned obsolescence, bloatware, and the erosion of privacy. This talk will discuss an alternative viewpoint in which an Open Hardware design praxis enables tailored, privacy-preserving, small scale manufacturing of personal computation devices. Bio: Brandon Wiley is the President of the Operator Foundation, a non-profit that develops and deploys technology to intervene in situations where the privacy, security, or freedom of speech of individuals or groups are threatened. 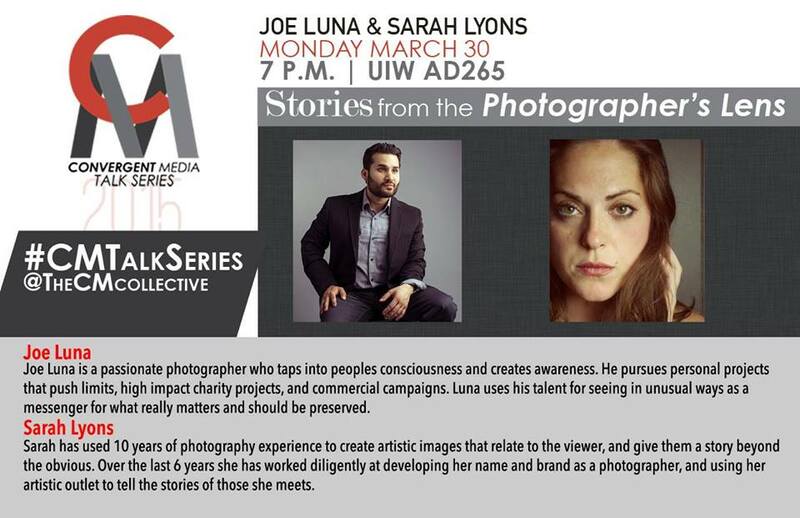 Joe Luna and Sarah Lyon’s will share their perspectives on photography and being a photographer in San Antonio and beyond. So come ready with questions and be prepared for a great evening of discussion and visual stimulation! Description: My inspiration for this project comes from a deep rooted understanding of the struggles associated with being an immigrant in this country. I am first generation born in the United States, first on my mother’s side and second on my father’s. My parents worked hard their entire lives in order to provide my siblings and I with the foundation that is required for proper development and success in this life. My father worked as a welder and my mother worked cafeteria jobs. Although we have labored past those trying times, I can’t ignore those that are currently living that reality. As fate would have it, this project has brought me full circle: Once plagued by the challenges of my circumstances, I can now provide a voice through photography for those facing an uncertain future. Day laborers are among the hardest working people in our society. Many have traveled far from their families in hopes of a better life. They work all types of labor intensive jobs that barely allow them to make a living. Such as: construction, handyman, lawn service and carpentry work. They work long days sometimes with little or no food, yet day after day, year after year, their life never changes. Though they cling to the bottom of our economy, many are hopeful that every day brings a new opportunity. Bio: Joe Luna is a passionate photographer who taps into peoples consciousness and creates awareness. He pursues personal projects that push limits, high impact charity projects, and commercial campaigns. Luna uses his talent for seeing in unusual ways as a messenger for what really matters and should be preserved. Luna’s work has been exhibited at The Art Institute of San Antonio and The Carver Community Cultural Center in San Antonio, as well as the Guadalupe Cultural Arts in San Antonio, Texas. His work was also exhibited at the PDN Photoplus International Conference, Javits Convention Center, New York City by Hahnemuhle Paper USA. Description: The definition of success varies wildly amongst individual and profession, but for myself in photography the necessity to adapt to the media driven consumer base has been a crucial tool to get there. I will share my journey in building my brand, trial and errors in developing my craft, and conventional and unconventional ways that I brought city together in my 1005 Faces project. All in 30 convenient tips and tricks to success. Bio: Sarah has used 10 years of photography experience to create artistic images that relate to the viewer, and give them a story beyond the obvious. After graduating with a degree in Photography from SAC, Sarah began photographing everything possible as a way to complete her next two years of college. After receiving her Bachelors she began freelancing and assisting other photographers. Initially taking on all kinds of photographic work, from food to weddings and everything in between; she has found a preference for portraiture and international humanitarian photography. Over the last 6 years she has worked diligently at developing her name and brand as a photographer, and using her artistic outlet to tell the stories of those she meets. Convergent Media at UIW updated the event photo. Convergent Media at UIW’s photo. Convergent Media at UIW created the event. 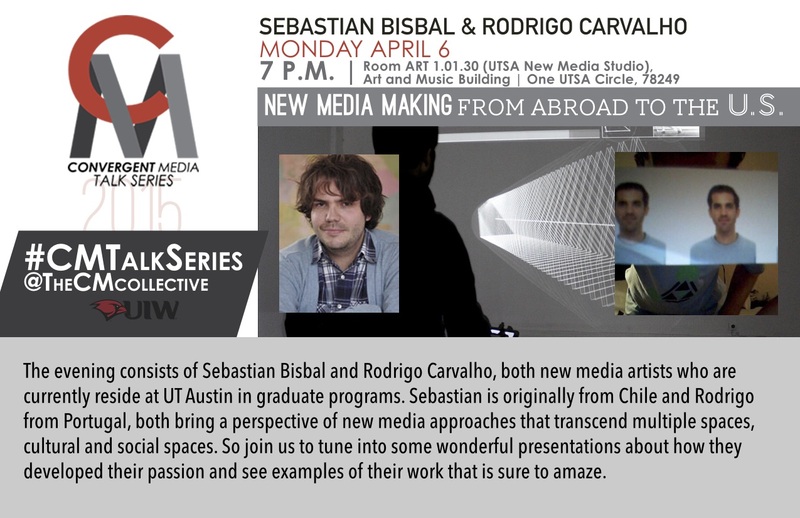 #CMTalkSeries: New Media making from abroad to the U.S. PLEASE NOTE: We will be having our talk at UTSA Main Campus! Yes we are truly collaborating and building bridges yay!!! Thanks Mark McCoin! The evening consists of Sebastian Bisbal and Rodrigo Carvalho, both new media artists who are currently reside at UT Austin in graduate programs. Sebastian is originally from Chile and Rodrigo from Portugal, both bring a perspective of new media approaches that transcend multiple spaces, cultural and social spaces. So join us to tune into some wonderful presentations about how they developed their passion and see examples of their work that is sure to amaze. Synergies between sound, movement and image in audiovisual real time systems and environments. In this talk I will share some of my work on interactive audiovisual systems for installations and performance work. With a wide range of typologies (from an experimental installation with mills and water, an av live act, or a reactive kinetic structure, among others) my focus goes to the relations and synergies between sound, visuals and movement in real time and on the transmutability of digital data between these three domains. In each project I try to explore the different system configurations of inputs and outputs that can be used, and its expressive potential. Rodrigo Carvalho (Porto, 1983), designer & new media artist from Porto/Portugal. Graduated in Design (U. Aveiro-PT, 2005) and with a Master Degree in Digital Arts (U.Pompeu Fabra, Barcelona,2009). Rodrigo’s work on live visuals, coding and interactive art involves a range of different outputs, from screen digital work, interactive installations, audiovisual live acts, or interactive visuals for stage performance. His work has been exhibited/performed at events and locations including: Sonar Festival(Barcelona, 2012),Mutek (Barcelona 2013), ISEA(Dubai, 2014), Ears, Eyes and Feet (Austin, 2014), VAVA showroom (Berlin/Barcelona/Porto/Paris, 2014/2015), XCOAX (2014) among others. He is currently enrolled in a PhD program for Digital Media at the University of Porto/FCT under the UT Austin/Portugal Program. His research is focused on the relations and the synergies between sound, movement and image in audiovisual real time systems and environments.